In current meta (and probably next meta) 7 and more attack minion without instant effect on the board = crap.Sad but true. 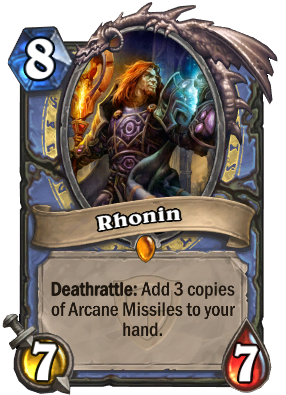 8 mana 7/7 +3 arcane missiles. Gadgetzan Auctioneer + Flamewaker + Archmage Antonidas has a good synergy. Not a bad card. Damn I wish this was a battlecry. Also why 8 mana? Dr. Boom is arguably stronger (without counting class spell synergy) then this at 7 mana. Blizz are crushing it today! Some super viable legendaries! Ah, fantastic. Now I can really annoy people with some Flamewaker insanity.